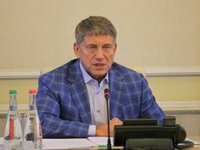 Ukraine's Minister of Energy and Coal Industry Ihor Nasalyk has stated that foreign companies are interested in developing hydrocarbon sites in Ukraine under the terms of product sharing agreements (PSA). The following deposits are put up for auction: Hrunivsky, Varvynsky, Rusanivsky, Okhtyrsky, Buzivsky, Zenkivsky, Ivanivsky, Ichniansky, Balakleisky, Sofiyevsky, Berestiansky, and Uhnivsky. The fields are located in Ivano-Frankivsk, Lviv, Poltava, Chernihiv, Sumy, and Kharkiv regions. The term of PSAs is 50 years. Applications for participation in the tenders are accepted within three months from the date of publication of the announcement of their conduct. It is assumed that the state's share in profitable products should be at least 11% of its total volume, the maximum investor's share is 70% of total production (until full reimbursement for investor expenses).